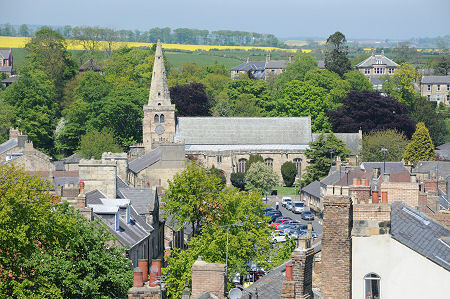 St Lawrence Church stands overlooking the River Coquet, at the north end of the beautiful village of Warkworth. The main road through the village bypasses the church, as it stands at the head of the market place. If you are travelling north you see the church ahead of you and to your left as you descend Castle Street from Warkworth Castle, but if travelling south there is every chance you might overlook it altogether. St Lawrence Church is extremely attractive and built, like much of the rest of the village, in a light honey coloured stone. It is the largest and most complete Norman church to have survived in Northumberland, though its origins go back considerably further. The first reference to St Lawrence Church was in 737, when along with the surrounding estates, then known as Wercewode, it was among the properties granted by King Ceolwulf of Northumbria to the monastery on Lindisfarne when he abdicated his crown to become a monk there. 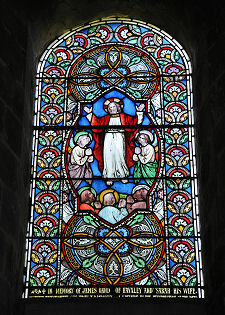 It seems likely that at that time the church was built from wood, and very unlikely that it survived the Viking raids of the late 800s, at least one of which (in 875) laid waste to much of Northumbria after a landing on the banks of the River Coquet only a short distance downstream from Warkworth. Repairs seem to have been completed fairly quickly, and the remains of stone foundations dating back to the end of the 800s or the early 900s have been found under the existing chancel arch. Work on a buttress against the north wall of the nave in 2008 revealed traces of a structure which might have been a side chapel of this early church. Henry I gave the income from St Lawrence Church (along with that from a number of other churches in the area) to his Chaplain, Richard do Aurea Valle, and this subsequently passed to the Diocese of Carlisle. The narrow nave and the chancel of the church you see today date back to a rebuild in the 1130s. The tower at the west end was added in about 1200, and the belfry and spire added to the top in the 1300s. The south aisle, which is nearly as broad as the nave, largely completed the structure of the church as you see it today in the 1400s, though some of the windows were added in the 1800s. 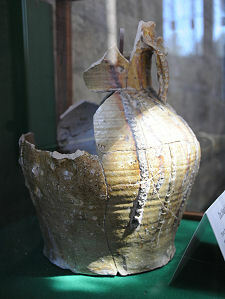 The Vikings were not the only raiders to have made a mark on Warkworth. On Saturday 13 July 1174, a Scottish army led by Duncan, Earl of Fife, attacked and destroyed the village, and massacred 300 villagers who had gathered for protection in the church. The Jacobite army that arrived in 1715 had slightly less disastrous consequences for the village. On Sunday 9 October 1715 the service in St Lawrence Church was taken by the Chaplain of James Francis Edward Stuart, "The Pretender". The service was followed by a rather premature proclamation of James III as King of England in the Market Place. Another notable visitor was John Wesley, who preached in the church in May 1761. For a church with such a very long history, the churchyard at St Lawrence is home to surprisingly few gravemarkers and monuments. 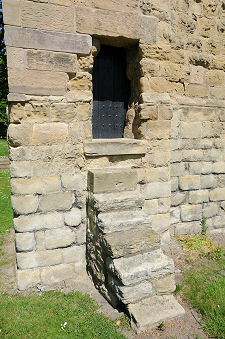 A notable exception is the box tomb located to the east of the path linking the main gate and the door of the church. This is known as "The Huntsman's Tomb", and is the last resting place of Edward Dodsworth, huntsman to King James I/VI, who died on 30 May 1630. A little further round the church, in the angle between the end of the south aisle and the chancel, are three medieval stone coffins which were originally discovered beneath the church floor. On the north side of the church you can see the original wall of the nave, supported by massive buttresses intended to prevent the building moving on shallow foundations built on sand. Originally built in the 1200s and 1300s, the threat of collapse of the north wall was such that in 2008 two were replaced, built on 22m deep piles extending all the way down to the bedrock. 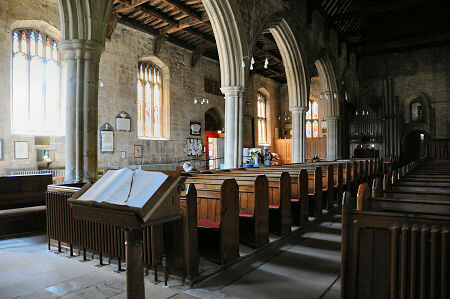 The interior of the church is as attractive as its exterior, though the fact that the aisle is almost as wide as the nave can be a little confusing. There are many fascinating details to be appreciated, and it really is worth buying a copy of the guidebook to make the most of your visit. Two points are particularly worth looking out for. 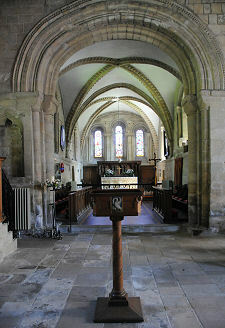 The chancel arch stands on the site of the altar of the Saxon church, and represents a continuous history of Christian worship extending back nearly thirteen centuries. Not far from the main entrance is "The Knight's Tomb", a superbly carved and preserved effigy of a knight dating back to about 1330. The inscription on the base of the tomb, which dates back to the 1600s, says it is the effigy of Sir Hugh of Morwick, but this may be an error as the arms on the knight's shield are those of the de Aubly family of Durham.